Just weeks after the airline troika of American Airlines, British Airways and Iberia gained antitrust immunity from U.S. and E.U. regulators to expand its transatlantic alliance on flights between the U.S. and Europe, it was Sir Richard Branson who was taking a victory lap around the George R. Brown Convention Center in Houston. A fierce critic of global coalitions and of American Airlines and British Airways in particular, Branson was attending the National Business Travel Association's conclave, where he made it clear that he had no intention of being trounced by what he called "these monster monopolies." As usual, Branson had some new windmills at which to tilt. He announced that the Virgin Group is integrating its separate airlines into a "quality alliance." The coalition comprises Virgin Atlantic, Virgin America and the Virgin Blue Group, which includes subsidiary V Australia. Always ready to rumble, Branson also trumpeted that starting in December, Virgin America will touch down in American Airlines' own backyard: the Dallas-Fort Worth International Airport. Virgin American will fly to Los Angeles and San Francisco from Dallas, competing on routes long controlled by American. The scene was classic Branson. Striding through the convention center flanked by a pair of glam Virgin flight attendants  and with Dallas Mayor Tom Leppert trailing him like an awed intern  Branson was swarmed by conventiongoers. He posed for pictures, kissed the ladies and celebrated by handing out vouchers for free flights on Virgin's new Dallas routes. At 60, Branson remains the rebel mogul. He built his $17 billion Virgin empire by shaking up markets  everything from music to mobile phones to space travel  as the cool consumer's David taking on the world's corporate Goliaths. In 1984, Branson launched Virgin Atlantic with one leased jumbo jet and a mission: to reinvent the travel experience by offering fun, as well as competitive prices. The inaugural flight from London to Newark featured an onboard performance by cellist Julian Lloyd Webber and ushered in a host of amenities such as walk-up bars and seat-back entertainment systems. Today, Virgin Atlantic is Britain's second largest long-haul carrier, behind British Airways, generating $3.66 billion in revenue and spanning 30 global destinations. It spawned Virgin Blue in 2000, Virgin America in 2003 and V Australia last February. Despite having different missions  domestic vs. international, short haul vs. long haul and low fare vs. traditional coach/upper class  each carries the Virgin DNA. Branson aims to challenge the global-airline alliances  One World, Sky and Star  by circling his wagons. 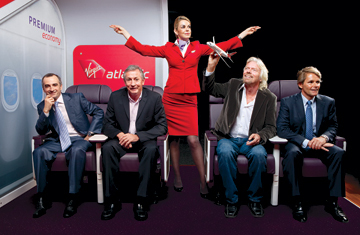 In creating a fourth alliance, one differentiated by a passenger experience that is uniquely Virgin, Branson plans to transform the disparate Virgin airline brands into a seamless carrier that can compete with the big three. "Virgin is synonymous with taking on the big guys," he says. "The only way companies survive is to be miles ahead of the competition. That's what we do." Or attempt to do. As he cheerfully admits, "Sometimes we fall flat on our face." In other words, this is a large and risky tactical shift for the company to make. Can Branson, a brilliant guerrilla fighter, directly engage the giant confederations that dominate the skies and win? Michael Boyd, president of the aviation consulting firm Boyd Group in Evergreen, Colo., is skeptical. "No question there is a role they can play," he says. "But as a threat to the three major alliances, I don't think so. I'm not saying Branson's wrong about the alliances reducing competition. But alliances are the way of the world. I can't stop it, and neither can he." Legacy carriers have sought refuge from shrinking demand and rising fuel costs in ever grander unions. The linkups, they say, create efficiencies while enhancing customer benefits, like allowing travelers to earn and burn frequent-flyer miles across a broad network of destinations. The AA-BA-Iberia arrangement, which features more than 5,000 daily departures from over 400 cities in more than 100 countries, makes it the second largest transatlantic consortium behind the Delta-Northwest-Air France-KLM partnership. It is also the closest thing under current law to a merger without actually being one. "This certainly opens up opportunities, for example, on fares and the ability to combine more places to shop," says Simon Talling-Smith, executive vice president of British Airways, Americas. Besides, he says, "our two main competitors are already doing these alliances. It lets us be more competitive with them." See pictures from the Farnborough Air Show.